Once you’ve picked the perfect spot for planting tomatoes, spend some time preparing your soil. The dirt is to be their home. You can help make it as welcoming as possible. Several weeks before planting tomatoes, check the plot you’ve selected. The soil is ready to work when it is dry enough not to clod up when squeezed into a ball and won’t stick to your garden tools. Begin preparing your soil by cultivating the bed 8-10 inches deep with a garden spade or tiller/cultivator. Remove debris. Break up soil clods. Work in 2-3 inches of compost or other organic matter into the top 6 inches. 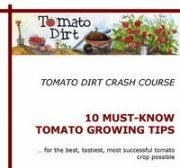 This is especially important step in preparing your soil for planting tomatoes whether you have rich, black loam or terrible dirt. Purchase rolls of plastic at home improvement stores or the local nursery. Then, a couple of weeks before planting tomatoes, get started preparing the soil temperature-wise. Position the black plastic in your garden plot and secure it with rocks, bricks, buckets, or other sturdy anchor. Remove the plastic when you place your tomato plants in the garden, unless you choose to use it as a weed deterrent around the newly planted seedlings. You also need to prepare your soil by checking its nutrient and chemical contents. Take a simple soil test of your soil to know how to amend it. Purchase an inexpensive soil test kit online or at a garden center. Or contact your local extension office and ask about local soil testing services. Soil testing will tell you the soil’s pH. You can use a simple pH test kit to determine the pH in your tomato patch. If you're planting a large number of tomatoes, then test several areas across the planting area. A neutral pH level is 7.0. Numbers lower than 7.0 indicate acidic soil – the lower the number, the more acidic the soil. Numbers higher than 7.0 indicate alkaline soil – the higher the number, the more alkaline the soil. Tomatoes grow best in slightly acidic soil with a pH level between 6.0 and 7.0 – optimum is between 6.5 and 7.0. If your soil’s pH isn’t within that range, make proper adjustments. To lower your soil’s pH, work sulfur into the soil. To raise your soil’s pH, work lime into the soil. An appropriate pH is an important component to preparing the soil for planting tomatoes. Nitrogen helps your tomatoes maintain healthy, green leaves. Yellowed older leaves and slowed growth indicate nitrogen deficiency. But when you apply too much nitrogen before fruit is set, stems become quite large, leaves are deep green and soft, and there are few if any flowers. Tomatoes need about 1-3⁄4 pounds of nitrogen per 500 square feet. Incorporate nitrogen into soil just before planting. Phosphorus helps your tomatoes develop strong root systems, build disease resistance, and cultivate fruit and seed formation. Slow, stunted growth and reddening stems and foliage indicate a phosphorus deficiency. Incorporate phosphorus-containing fertilizers into the soil before planting, rather than sprinkling them on the surface. Potassium helps promote growth and disease resistance in your tomato plants. Weak plants and slow growth indicate a potassium deficiency. In more severe cases, leaf edges will brown. An easy way to amend the soil is to add wood ash, which is 5% potassium. Best rate is about 10-15 pounds to a 300 square foot bed. Work in wood ash in the fall or winter. Compost is broken-down organic matter. It’s not particularly high in nutrients but it’s a fantastic way to improve your soil. Compost improves soil structure, increases its cultivability, aids in nutrient retention, reduces compaction, attracts earthworms, increases microbes, and protects plants from disease. Adding compost is the singular most important step you can take to preparing your soil for planting tomatoes. You can save money and make your own compost when you start your own compost pile at any time of the year.